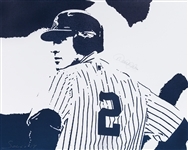 New York Yankees legendary shortstop Derek Jeter is immortalized in this canvas artwork by the noted sports and pop artist Bernard Solco. This canvas shows Jeter looking over his shoulder, his iconic number “2” presented to the viewer. The canvas artwork is white and navy, and done in a unique abstract style. 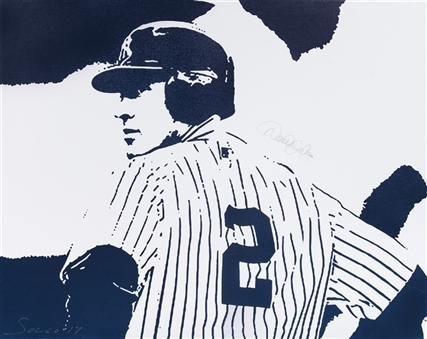 It measures 40 x 32.5 inches, and features Jeter’s silver marker signature over a large white portion. Solco has signed the bottom of this canvas in silver marker, inscribing “17” next to his signature. This item comes with a Steiner Sports hologram (SS220471).